Adding two new beds to the square foot garden. When you have success gardening it is natural to want to grow more and more of your own food. 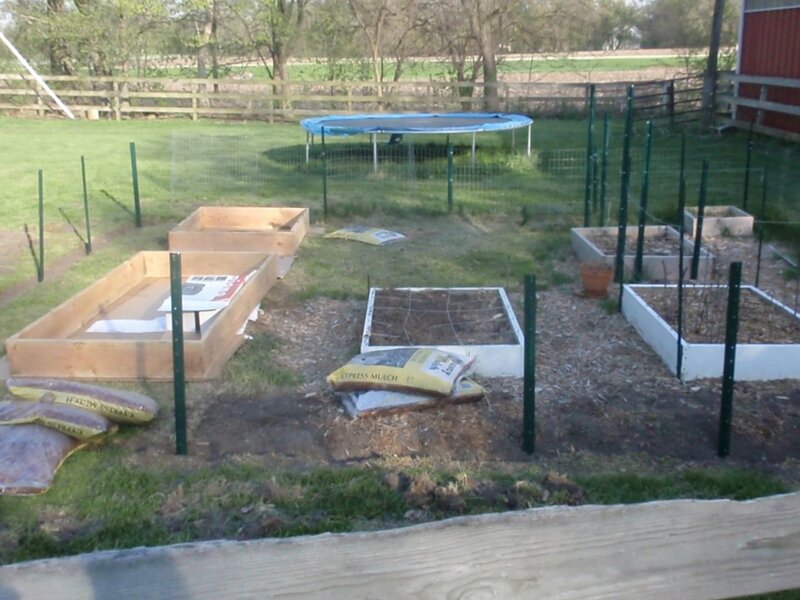 With square foot gardening it is easy to start small and add new beds each year. This post will show how I add a new bed. The photo to the left shows my garden during the expansion. By adding a 4×8 and a 4×4 bed, the growing space is practically doubled. There is a three foot welded wire fence around the garden that has proved sufficient to keep the chickens out of the garden. Cardboard is used to kill the grass. The first step in adding a new bed is to put the new box together. I use three exterior grade screws at each corner to hold the each of the 2×10 boards together. Next, I mow the grass down by setting the lawn mower on its lowest setting. Then I use the weed whacker to cut the grass down as low as possible. 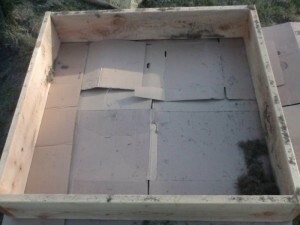 Finally, I place cardboard on the bottom of the box to kill the grass. This is easier than digging up the turf. 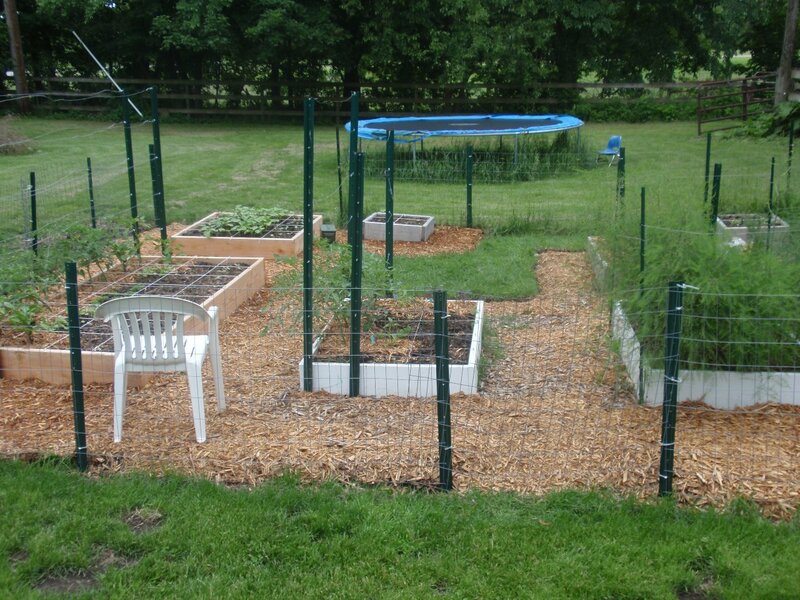 It is also slightly different than the method recommended in the square foot gardening book of using weed barrier. I have found that after a year underneath the garden soil, the cardboard is completely decomposed. The three ingredients of Mel’s mix. Shovel the ingredients onto the tarp. Fully mixed soil in the new bed. 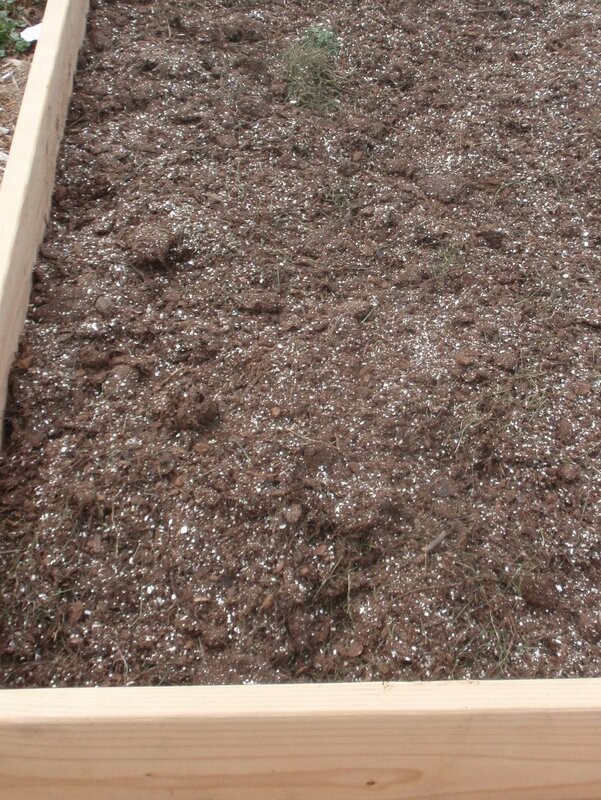 Square foot garden soil is a mixture of compost, peat moss and vermiculite. Each ingredient is very important and serves a purpose. The compost provides fertility. 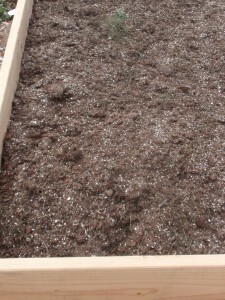 The peat moss helps retain moisture. 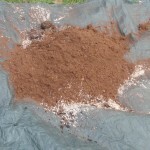 The vermiculite provides structure and keeps the soil loose and friable. 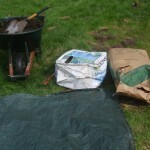 The soil is mixed by shovelling equal amounts of each ingredient onto a tarp. Then the tarp is used to tumble the mix end over end until it is well mixed. This mix has worked well for me. The soil becomes dark, rich and worm filled. Whenever I plant seedlings into the beds, worms fall into the holes dug for the new seedlings. To save money I make my own compost. 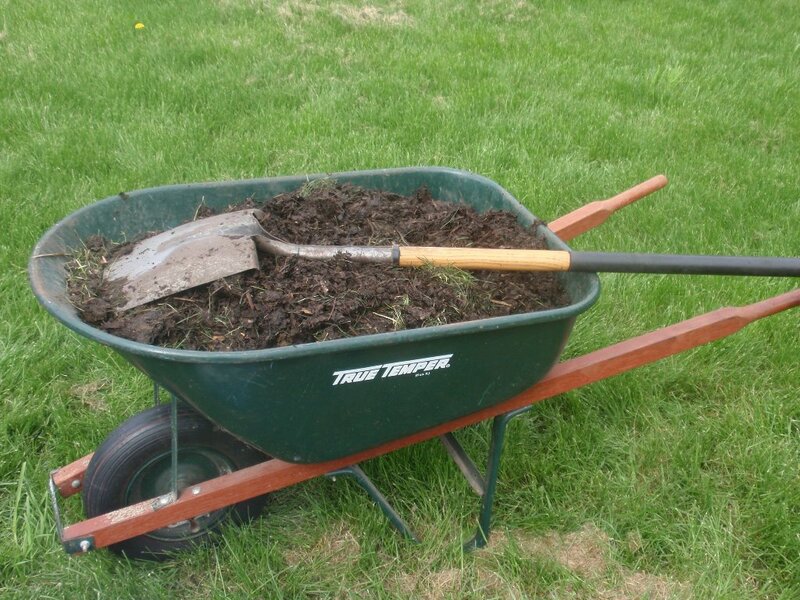 The main ingredients of my compost are grass clippings mixed with leaves, chicken manure mixed with pine shavings and Alpaca manure. 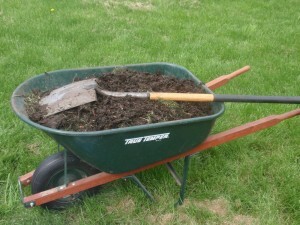 The compost also contains buckets of coffee grounds from a local coffee shop as well as kitchen scraps. 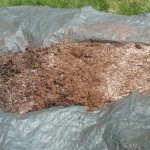 If money is really tight it is possible to fill the bed in entirely with home made compost. The garden after adding two new beds. Once the soil has been added, I give it a good soaking with a hose. Then I like to wait until the next day to plant into the bed. The final picture shows what the garden looks like with the new beds. The asparagus bed on the right is blocking the view of the strawberry bed. 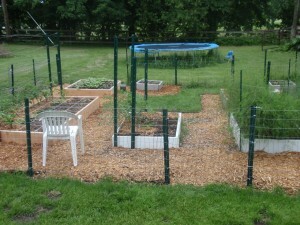 The patch of grass in the middle of the garden provides space for watermelons and squash to grow. The aisles may seem wide now but by the end of the season they won’t seem so roomy.